If you buy a car in this program, you'll have additional assurances about its reliability. Nissan promises 24/7 Emergency Roadside Assistance. If you happen to get a flat tire on the road, someone will help come and change it. You'll also have help with a dead battery or a lock-out situation any hour of the day and any day of the year. The vehicle is covered for seven years or 100,000 miles with a limited warranty. This warranty and program benefits are available to a new private owner if you decide to sell the vehicle during this time as well. 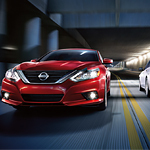 Take a test drive at Nissan North today.